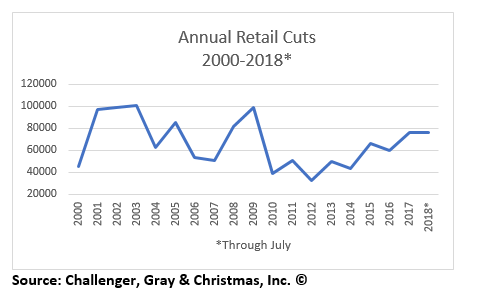 2018 July Job Cut Report: Cuts Plummet to 27,122; YTD Cuts Up 7 Percent | Challenger, Gray & Christmas, Inc.
July’s total fell 27.1 percent from the 37,202 cuts announced in June and 4.2 percent from the same time last year, when 28,307 cuts were announced. Last month’s total was the lowest of the year, falling below the previous low of 31,517 recorded in May. July’s cuts were the lowest since November 2016, when employers announced 26,936 cuts. “The economy is at near-full employment. Nearly 90 percent of companies recently polled by Challenger are either actively hiring or in retention mode. Companies are not letting go of their workforces right now,” said John Challenger, Chief Executive Officer of Challenger, Gray & Christmas, Inc. So far this year, employers have announced 272,301 cuts, 6.7 percent higher than the 255,307 announced through this point last year. Retailers continue to lead in job cuts, with 75,763 announced so far this year. That is 18.4 percent higher than the 63,989 Retail jobs cut through this point last year. The seven-month total for Retail job cuts is 321 cuts away from the full-year total in 2017. “Retail cuts have been inching up the last four years, as online shopping causes disruptions to business as usual. We’re starting to see layoffs in this sector that rival recession years,” said Challenger. Health Care companies follow in cuts with 28,484, up 32 percent from the 21,554 cuts announced in this sector in the first seven months of last year. “Health Care providers are undergoing cost-cutting measures and targeting labor costs, all while dealing with skills shortages. Hospitals especially face challenges in balancing cost-saving measures with quality-of-care issues,” said Challenger. The Services sector announced 24,168 cuts so far this year. Consumer Products manufacturers announced 22,210 through July, 238.7 percent more than the 6,558 cuts announced through July 2017. In the last two months, the Trump Administration’s steel tariffs have cost a total of 70 jobs, according to Challenger tracking. Automotive manufacturers, vulnerable to trade war fears, round out the top five job-cutting industries this year with 11,696, down 13.5 percent from the 13,521 announced through July 2017. “We simply do not yet know what impact the tariffs on steel, as well as other proposed tariffs, may have on jobs. We’re seeing a trickle of job cuts related to these tariffs, but it is not yet torrential,” said Challenger.